According to the Consumer Product Safety Commission, old cribs and used crib mattresses pose a great threat to baby safety. You may have a beautiful antique baby crib, but for your baby’s sake, use it for decorative purposes only. Lead paint or finishes may be one issue, as well as the possibility of broken or missing hardware among other hazards. > Slats should be no more than 2 3/8” apart (about the width of a soda can) so that baby’s head doesn’t keep trapped in the space. > Corner posts should not be higher than 1/16”. Greater height could result in baby’s clothing getting caught and risk strangling baby. > There should be no design cutouts in the headboard or footboard. > Mattress hangers, the supports for the mattress at the bottom of the crib, should be adjustable as baby grows to prevent climbing out. The mattress hanger should be securely fastened to the corners of the crib. > Drop side needs to have a locking, hand-operated latch. 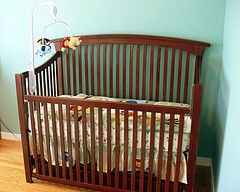 Remember to raise the crib sides to full height and lock when infant is inside. > Look for Juvenile Product Manufacturers Association (JPMA) certification. This means the crib has been independently tested and meets standards developed by the American Society for Testing and Materials (ASTM). > Babies love the motion of mobiles and they can be used safely as long as they are out of baby’s reach. When your baby fist begins to push up on his hands and knees or when the baby is 5 months old, it should be removed to prevent injury. > Don't hang anything on the crib. Babies have died when they became entangled in straps on diaper bags, diaper stackers and purses that had been hung on cribs. > If a crib has rollers or casters, make sure they are locking. On wood floors, accidentally pushing a crib could be devastating. The safest choice is to get a crib with no wheels. > Don't lift your baby over the side of the crib without dropping the side first. You'll be showing her how to escape. Also get in the habit of raising and locking the sides as soon as your baby is in the crib and check that all latches are locked. > Do not place baby on a waterbed, sofa, soft mattress, pillow, or other soft surface due to the risk of suffocation. > Be sure to inspect every crib your child uses for safety - those at the grandparent's home, the baby-sitter's home, or the child care center. > When your baby can sit up by himself, it’s time to lower the position of the mattress. When he can stand, put it in the lowest position. > When your child stands more than a couple of inches taller than the sidebar with the mattress in the lowest position (approx. 35” tall) or if your child is climbing out of the crib, for his safety put him in a toddler bed or regular bed. This usually happens around age 2 but can be earlier. > We recommend frequent inspections to identify wear and tear before injury occurs. Make sure that slats and end boards are secure and tighten nuts and bolts. If you find a problem that can’t be fixed, throw the crib away and get a new one. It’s not worth the risk to your child. Where should you place the crib in the room? Believe it or not, where the crib is placed can make a big difference in terms of safety. It is recommended that you keep the crib at least one foot away from all furniture and walls. If baby were able to climb out, he may get wedged between the crib and the wall and not be able to breathe. Also, if it’s close to furniture, baby may be able to reach items that could be dangerous for him to have. It is also recommended that the crib not be placed near a window as the draw cord from draperies or a window blink cord could strangle baby. Also, don’t forget to discard any plastic wrapping materials from your new crib or crib accessories as baby may accidentally suffocate from them.